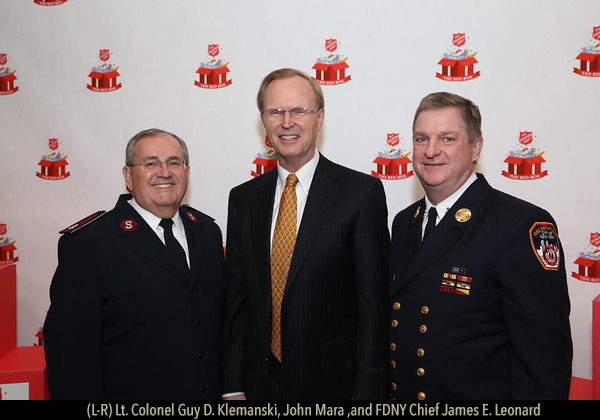 Emphasizing the themes of family and The Salvation Army’s burgeoning Red Box Campaign, The Salvation Army Greater New York Division’s 68th Annual Gala was held on December 8, 2015, at the New York Marriott Marquis in Times Square, uniting old friends and new within The Army’s universal family. Hosted by former New York Giants offensive lineman David Diehl and broadcaster Bob Papa, the evening featured a Musical Invocation (“The Prayer”) by singers Will & Anthony; a Christmas Message delivered by His Eminence, Timothy Cardinal Dolan, Archbishop of New York; performances by The Army’s Greater New York Youth Band & Chorus; and a concert featuring screen, stage, and recording star Vanessa Williams. Lt. Colonel Guy D. Klemanski, Divisional Commander of The Salvation Army Greater New York Division, presented The Army’s highest honor, The Pinnacle of Achievement Award, to the Wellington & Ann Mara family. Owners of New York Giants, the Maras have worked closely with The Salvation Army over the years and been a strong philanthropic force in the community. “The Maras represent The New York Giants, of course, but they also have giant hearts, which they use to give back, creating immense positive changes for those around them,” said Lt. Colonel Klemanski. John Mara, President and CEO of the Giants, and eldest son of the late Wellington and Ann, accepted the award on behalf of the family. The evening’s other honoree, The Fire Department, City of New York — like The Salvation Army celebrating its 150th anniversary in 2015 — was presented with The Army’s Community Service Award. Accepting the award on behalf of the FDNY was James E. Leonard, Chief of Department. The evening, attended by nearly 800 people, also served as the kickoff of The Salvation Army’s holiday Red Box Campaign, which provides what for some individuals and families might be the only gift they receive this Christmas — a box filled with non-perishable food, treats, warm clothes, toys, and other gift items. Last year, the holiday Red Box Campaign generated more than $450,000 in support. The Gala also served as the moment to announce that, beginning in 2016, the Red Box Campaign would no longer be just a holiday campaign but a year-‘round effort, serving the many diverse populations assisted by The Salvation Army throughout the Greater New York area. The Gala program concluded with an uplifting concert by Ms. Williams, followed by the benediction by Alan Gover, a member of The Salvation Army’s Greater New York Advisory Board.